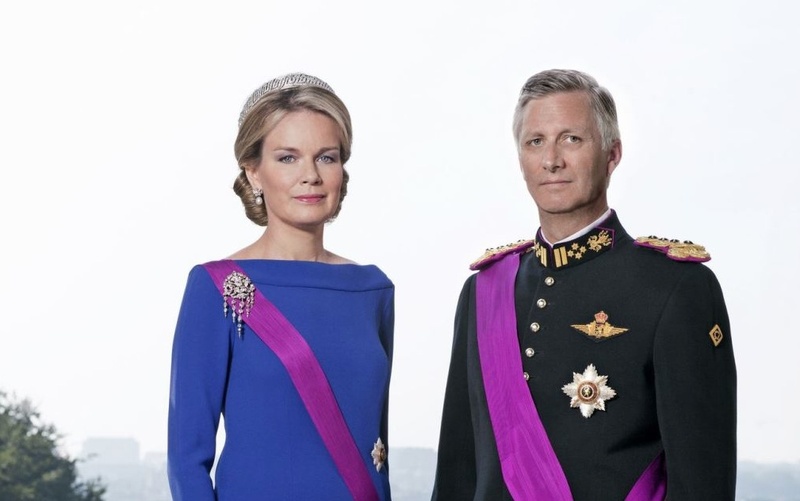 Their Majesties King Philippe and Queen Mathilde of Belgium Attend a Concert in Brussels. On Sunday, November 9, 2014, Their Majesties King Philippe and Queen Mathilde of Belgium attended the Thousand Voices for Peace concert held at the Basilique Nationale du Sacré-Cœur in Brussels. The concert, organized by the Festival van Vlaanderen, was held in commemoration of World War I. Their Majesties King Willem-Alexander and Queen Maxima of the Netherlands Attend a Baptism at Paleis Het Loo. On Sunday, November 9, 2014, Their Majesties King Willem-Alexander and Queen Maxima of the Netherlands accompanied by their three daughters, Her Royal Highness Princess Beatrix of the Netherlands, Her Royal Highness Princess Laurentien of the Netherlands, Their Royal Highnesses Prince Bernhard and Princess Annette of Oranje-Nassau, Their Royal Highnesses Prince Maritus and Princess Marilene of Oranje-Nassau, Their Royal Highnesses Prince Pieter-Christian and Princess Anita of Oranje-Nassau attended the baptism of Willem-Jan, son of Their Royal Highnesses Prince Floris and Princess Aimée of Oranje-Nassau, at Paleis Het Loo in Apeldoorn. On Sunday, November 9, 2014, His Royal Highness Prince Harry of Wales along with members of the British armed forces attended Remembrance Sunday service at Kandahar Airfield in Kandahar, Afghanistan. For more information about today’s surprise visit as please click here. On November 9, 2014, Their Imperial Highnesses Crown Prince Naruhito and Crown Princess Masako of Japan arrived in the Aichi Prefecture for a two-day visit. Tomorrow, Crown Prince Naruhito will attend the opening of the United Nations Educational, Scientific, and Cultural (UNESCO) 2014 World Conference on Education for Sustainable Development. Held under the theme, Learning Today for a Sustainable Future, the conference will “…celebrate [the] achievements made and identify lessons learnt, while setting the stage for the future of ESD through the Global Action Program…” according to the official website for UNESCO. On November 9, 2014, Their Imperial Majesties Emperor Akihito and Empress Michiko of Japan attended a concert by the Metropolitan Police Department Music Band in Tokyo. On Sunday, November 9, 2014, Her Majesty Queen Elizabeth II and His Royal Highness The Duke of Edinburgh accompanied by Their Royal Highnesses The Prince of Wales, His Royal Highness The Duke of York, His Royal Highness The Duke of Cambridge and His Royal Highness The Duke of Kent led Remembrance Sunday service, which honors British and Commonwealth soldiers who lost their lives in battle, at the Cenotaph on Whitehall in London, England. During today’s solemn ceremony Her Majesty placed a wreath at the foot of the Cenotaph which was built after World War I. Their Royal Highnesses The Duke of Edinburgh, The Prince of Wales, The Duke of Cambridge and the Duke of Kent also placed wreathes at the foot of the Cenotaph. Watching nearby were Their Royal Highnesses The Duchess of Cornwall, The Countess of Wessex, and The Duchess of Cambridge. For more information about today’s important event as well as to view photos please click the links below.